That’s the date when area fans, players and coaches of high school football will find out just how much the local landscape will change as it pertains to the playoffs. On Mar. 14, the CIF-Southern Section will make public the new football playoff division proposals by Southern Section assistant commissioner Glenn Martinez. And as of now, questions abound about the fate of several local teams and leagues. Some teams could be in for a serious boost in competition by being placed in new divisions. Others could see their chances at championship glory improve greatly with the deletion of powerful leagues from their current divisions. If it sounds like we’re talking about Monrovia, it’s because we are. The Wildcats won three consecutive Mid-Valley Division championships between 2010-13 and were heavy favorites to win a fourth last season before being upset by Paraclete in the semifinals. Will that setback be enough to keep Monrovia and the Rio Hondo League in the Mid-Valley Division? Or is Martinez about to move the league into tougher surroundings in order to ratchet up the competition? As of now, Monrovia is a team without a coach. Ryan Maddox, who led Monrovia on its wildly successful recent run resigned following the season and the school is currently fielding applications to find his replacement. If Monrovia and the Rio Hondo League are moved out of the Mid-Valley Division, several local teams could see their chances at championship glory improve greatly. Or, last year’s champ San Dimas could be poised for a dominant run at more hardware. The other big question around the area is where exactly the new-look Hacienda League will be placed. Charter Oak was moved into the league during the last re-leaguing cycle. The Chargers join other area football powers in Diamond Ranch, Los Altos and West Covina. But will the Hacienda League remain part of the Southeast Division as we know it? That’s the big mystery, but there’s been rumors that the Hacienda League could be moving to another division that would have several new leagues as well. One of those new leagues being bandied about is the newly formed Palomares League, which features local teams in Bonita, Glendora, South Hills, Diamond Bar, Claremont and Chino. The consensus among area fans is that they’d like to see both the Hacienda and Palomares leagues compete in the same playoff division in order to produce some very enticing postseason matchups between local teams. It’s hard to envision a scenario in which the Del Rio and Suburban leagues don’t stay in the same division. They both currently play in the Southeast Division, which could get a face lift if the Hacienda League is moved out. The proposals are the brainchild of Martinez, who also consults with a football advisory committee to gain feedback and ideas. The proposals are based on the standard CIF formula of factoring in enrollment, geography and competitive equity. Schools can appeal the proposals based only the three factors in the formula. The new divisions will be ratified at the Southern Section council meeting in April. La Puente football coach Scott Morrison, who is on the board of the Southern California Interscholastic Football Coaches Assocation, or SCIFCA, is on the football advisory committee for the Southern Section. Morrison drafted his own playoff proposals, not representing either organization. The reactions to Morrison’s proposals were designed to stoke conversation and gather input. They did that, and more. Morrison was quick to point out that his proposals are far from official. “Our advisory board is strictly that,” Morrison said. “We simply advise. We don’t make any decisions about what things look like. I think the guys at CIF respect our knowledge of football, but at the end of the day we are not a decision making board. Cordell Broadus ends up at Bishop Gorman in Vegas …. Former Diamond Bar receiver Cordell Broadus, who left the school shortly after the 2013 season in search of a higher profile place to play, is now at Bishop Gorman in Las Vegas, according to a story in the Las Vegas Sun. The article suggests that Broadus’ family will establish residency in Vegas in order to make everything kosher. That shouldn’t be too hard since Broadus’ father is rapper/entertainer Snoop Dogg. Broadus was a Tribune All-Area selection in 2013 as a junior and already has several college offers. Aram’s Take: How will The Snoop Jr. Years be remembered in SGV lore? There’s the whole brawl against D-Ranch. There’s the incredible athletic ability. There’s the Robledo interview with Snoop at a playoff game. There’s the notoriety that D-Bar got … its most since Stephanie McDonald (hottie) was a student back in the early 90s. I guess it’s open to interpretation. Duarte High School will turn from one former standout local receiver to another to run its football program. 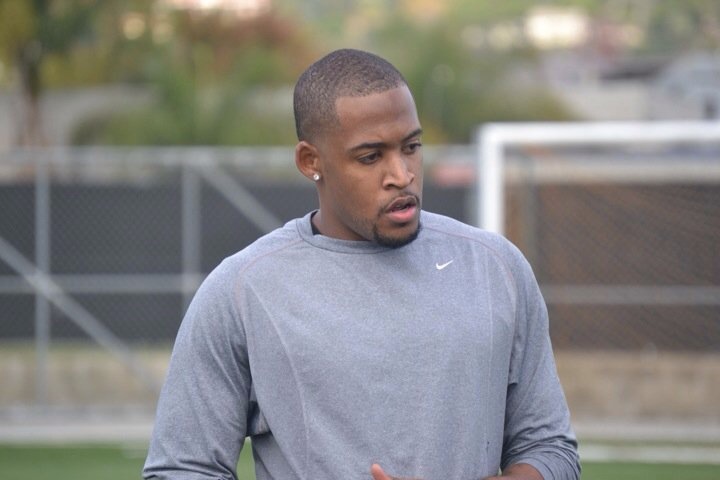 The school announced that former Los Altos standout Travis Brown as its new varsity football head coach. Brown replaces Jason Martin, who resigned recently after two seasons at the helm. Brown was a finalist for the Wilson job in December before the school hired his former high school coach Greg Gano. Brown then briefly joined the staff at Cantwell Sacred Heart before going after the Duarte job when Martin stepped down. Brown was a 2003 Tribune All-Area receiver at Los Altos and a key member of the Conquerors’ back-to-back CIF championship temas in ’02 and ’03. He later had a strong college career at New Mexico. Aram’s Take: Great hire for Duarte. Brown was one of the sharpest up-and-comers in the area and it was only a matter of time before he got his chance. Good of Duarte to be proactive and get him before anyone else did. Martin was on his way to building up the program to Crutchfield-like levels and the Falcons shouldn’t miss a beat with Brown. There’s talent in the area and with Monrovia a bit vulnerable while it searches for a coach, maybe Brown can seize on that. Ryan Maddox, who led Monrovia High School to three consecutive CIF championships between 2010-12, resigned as head coach of the Wildcats football program on Tuesday afternoon. Maddox was 69-14 in six seasons at Monrovia and got Monrovia to the championship game in the Mid-Valley Division four consecutive seasons. Maddox’s team won the Rio Hondo League championship in every season he was at the helm. “It’s something I thought about for a long time and just thought it was the right time,” Maddox said. “It’s time for me to start looking at the next step. I’m going to start applying and looking toward getting into administration. Arguably Monrovia’s finest season under Maddox came in 2012 when the Wildcats won the Mid-Valley Division for the third straight year and reached the CIF State bowl playoffs. Prior to taking over for Steve Garrison at Monrovia, Maddox was an assistant coach under Mike Maggiore at West Covina. He was on staff when the Bulldogs won a CIF championship in 2004. Aram’s take: I had heard during the season that Maddox would resign after this season to pursue coaching opportunities at either the college level or even a larger high school program. I dunno if there’s anything to that, but I thought I’d pass it along. Obviously, Maddox has built quite a resume for himself. He was/is clearly one of the best coaches around and hopefully he’ll land somewhere local … if he lands at all.